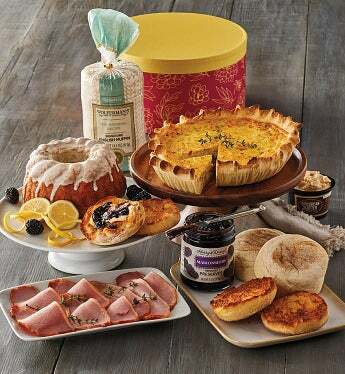 Easily create a delicious Mother's Day brunch and start Mom's day off with a smile. Serve up triple cheese and caramelized onion quiche-made here in our bakery-along with perfectly cured Canadian bacon by the slice. Lightly toast some Wolferman's® English muffins and then smother them in maple syrup butter or spread on marionberry preserves. For dessert, surprise her with a lemon poppyseed coffee cake, also from our bakery. This decadent meal arrives in a beautifully decorated hot box she'll keep long past the festivities.